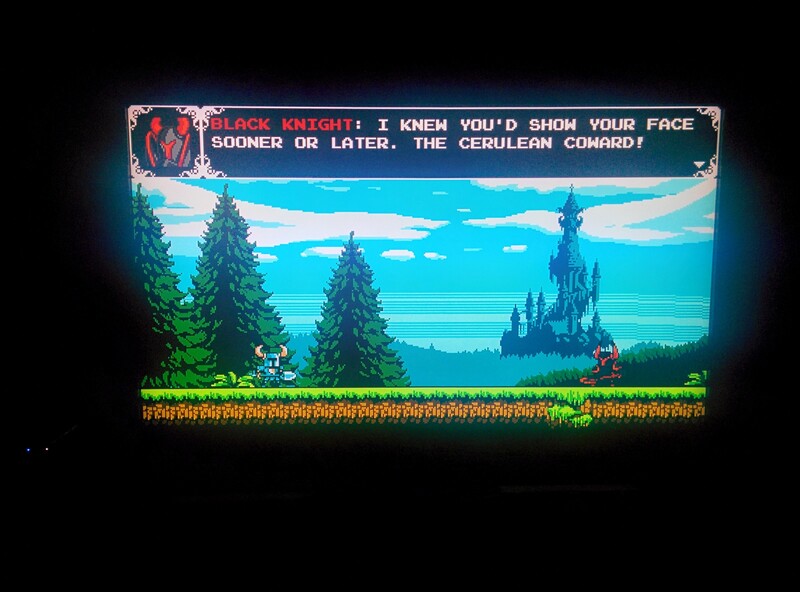 Shovel Knight nails the look and feel of the NES. It has been nearly 30 years since the Nintendo Entertainment System debuted in North America and no other console since has so dominated the culture, aesthetics, and market share of video gaming in its respective era. The NES not only had scarce competition, but its distinctive capabilities – and modest specs – ensured that it would leave a mark. After all, what other console in history could exert such influence and be so recognizable as to appear in a Ghost Busters movie? As the children of the 1980s and early 1990s have come of age, 8-bit nostalgia has flourished. A while back, I looked at Mutant Mudds Deluxe for Wii U, a delightfully straightforward, unabashed throwback platformer. Nintendo’s current generation consoles have become ecosystems for genres and styles seemingly from other times, whether pixelated side scrollers like Mutant Mudds Deluxe, HD games such as Donkey Kong Country: Tropical Freeze that reprise the retro difficulty of the NES and SNES, and visual novels such as the peerless Zero Escape: Virtue’s Last Reward. And now we have Shovel Knight. The platformer brought to Wii U and 3DS via Kickstarter is a gorgeous, endlessly playable love letter to 8-bit gaming. 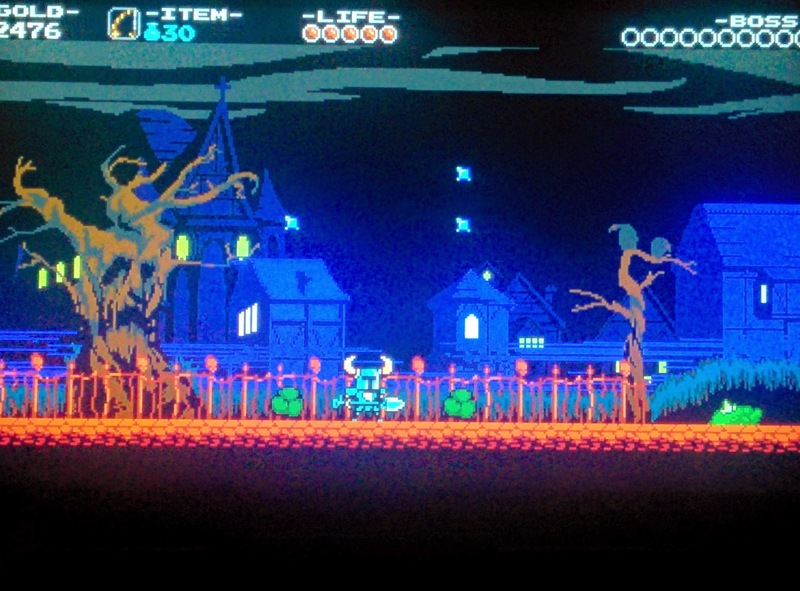 Shovel Knight has almost scholarly attention to the aesthetics of 8-bit gaming. The NES’s color palette is instantly recognizable in the game’s gorgeous underground caverns, crisp blue skies, lush forests, and lively towns. Players may find themselves thinking of classics such as Castlevania II: Simon’s Quest, Mega Man, and especially the Wizards and Warriors games. Speaking of Mega Man, composer Manami Matsumae contributes music here, along with Jake Kaufman. The soundtrack is pitch perfect, both on its own merits and as a nod to the annals of 8-bit gaming. I found myself endlessly humming the theme from the first stage in my head. The tunes are nice microcosm of Shovel Knight’s overall approach: Exceptional, encyclopedic 8-bit vocabulary, yet an experience that rises far above mere homage. Its modernity can be felt in the control scheme, especially the jumping, which is much crisper than in most NES platformers. The cutscenes, dialog, and exploratory sequences in the towns, while indebted to games such as Ninja Gaiden: The Dark Sword of Chaos, have a cohesiveness and theatricality that is of more recent vintage. Shovel Knight encounters Black Knight. The basic gameplay is inspired. Shovel Knight is a knight who starts with a shovel rather than a sword. The shovel can unearth diamonds, swipe enemies, or be used a pseudo-pogo stick, a la Scrooge McDuck in Duck Tales for NES. 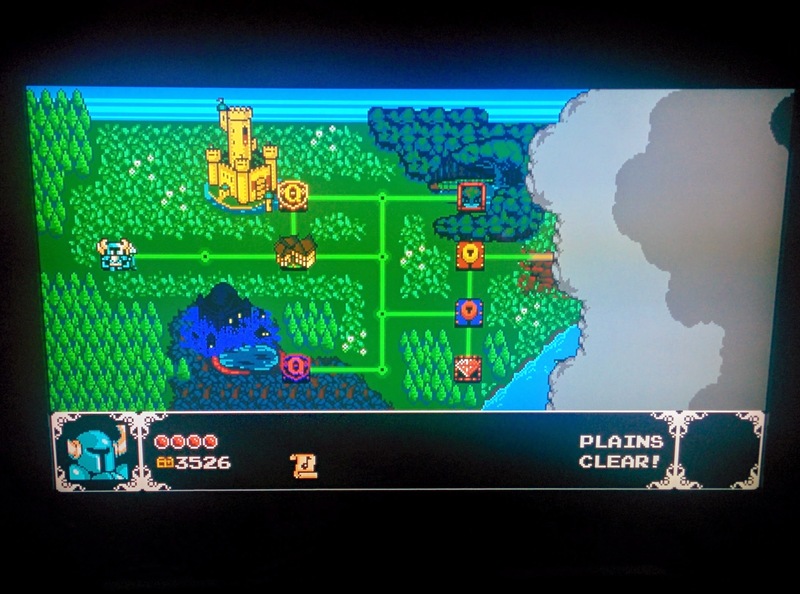 It takes a little while to get fully accustomed to the ins and outs of Shovel Knight. The pogo behavior was tricky at first, since it’s required to cross some chasms (a classic NES pitfall) but doesn’t quite work like it does in Duck Tales or Donkey Kong Country: Tropical Freeze, the latter of which imitated the former’s trademark feature. However, the controls are tight and simple overall. Difficulty is well calibrated. It masterfully emulates the platforming perils of its NES predecessors, but gives the player a break through Shovel Knight’s impressive jumping abilities and robust health meter (no one- or two-hit deaths a la Ghosts and Goblins). The boss battles are tough – I really enjoyed learning the ropes against the Death-like Specter Knight. Finally, the game is deep, with plenty to collect and explore. Playing the Wii U version, I appreciated how it grouped items neatly on the Game Pad and used Miiverse to provide a community diary of each room. A must-have for any Wii U library.